A newbie to Ultra Marathons, this blog is my attempt to chronicle my trials and errors during training runs and races and everything else along the way. What an awesome race! This felt like my most important race in the last 2 years since I started racing "seriously", obviously aside from my first ultra marathon, my first 50 mile race and my first 100 mile race. Why, you ask? Why would a 5K road race be that important to me? 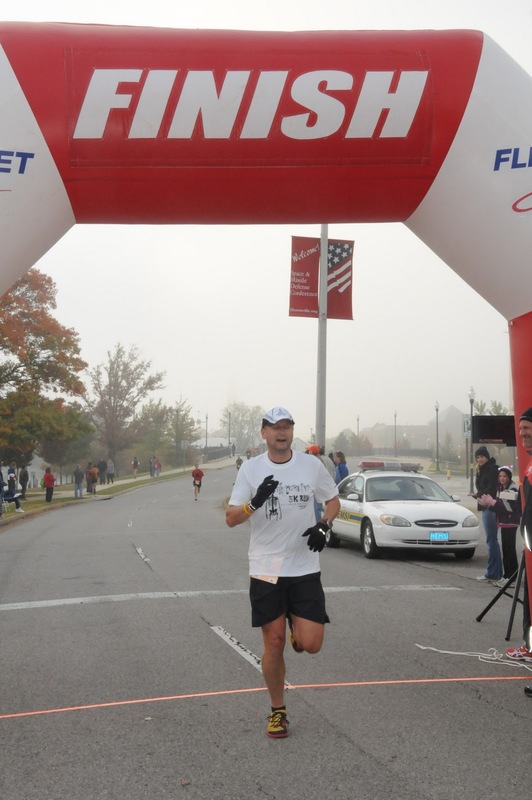 Let me explain, I'd been trying for two years to better my official PR of 20:10 that I set at the 2009 Frosty Freeze 5K in Decatur, AL. Two years, also referred to as eternity. I picked up my race packet Friday night and to my surprise, I found a nice tech shirt in the bag (unlike the t-shirts we received last year). Don't get me wrong,I like t-shirts,but I like tech shirrts even better. One can never have enough tech shirts. I checked with my running buddies and it appeared that only Jason Shattuck would be able to make it. I set my alarm for 6:30 AM to give myself time for the customary pre-race cup of coffee before heading to the race. I arrived in downtown at the race start at 7:30 AM. I decided to stay in my car just a little while longer until Jason showed up. To be honest, it was freaking cold and I didn't feel like being cold. With about 5 minutes to go, Jason and I headed to the actual start line. Wow, there was almost 700 racers lined up and ready to go. It also looked like everyone was planning to race and break records.As a matter of fact, race officials had to ask folks to step further back unless they expected to run the 5K in less than 18 minutes. Oops, that certainly wasn't me, but I had lined up in the second or third row, so I figured I'd be ok. As it turned out, I was. There may have been a total of three or four runners that passed me during the race, but I passed a couple as well, so I guess I lined up in the right spot. The starting area was so busy with runners, we barely heard the "ready,set go!" that started the race.We were packed like sardines, but that quickly changed when we took off running. Jason was ahead of me right from the start and I decided to keep a couple of folks in my sight that I knew would run just under 20 minute 5K pace. 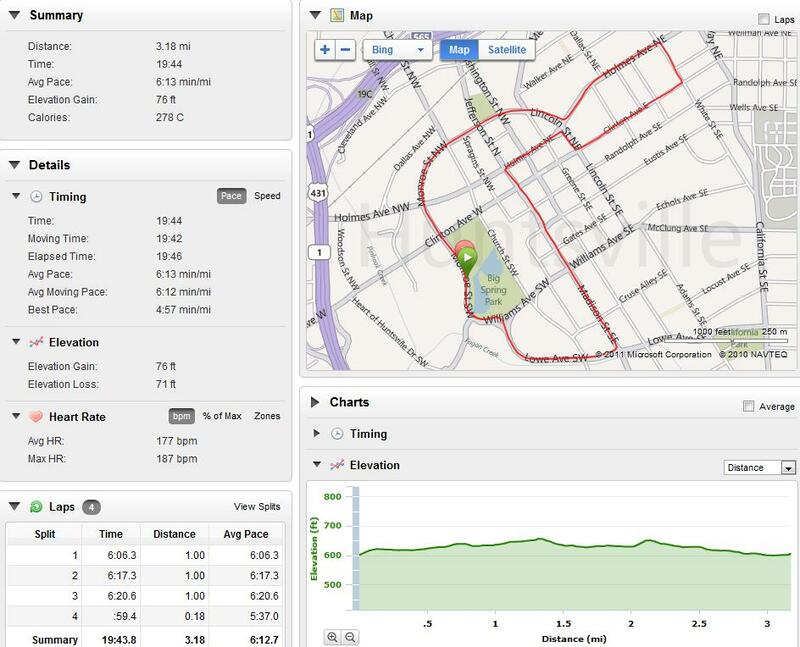 I had set up my Garmin screen to show my overall average pace to ensure that I'd stay as close to 6:15 pace as possible during the entire race. However, when my watch signaled the one mile split with the usual "beep", I decided not to look. I was around this time that I had reeled in Jason, I'm still not quite sure why and how. But it was short lived as he passed me again with a little under a mile to go. 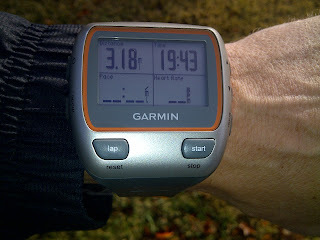 When my watch signaled the mile 2 split, I finally looked down to see how I was doing. Until then, I had purely been running by feel, following other runners along the course feeling pretty good. I hadn't checked my pace or heart rate or distance. In assence, I was racing "naked" until this point. 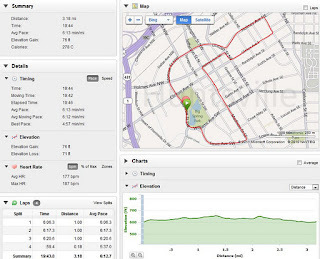 When I checked my pace on my Garmin Forerunner, it showed 6:17 split for the second mile. I was certain I had run at least that pace for the first mile. I continued to try to stay with the runners ahead of me, taking my eyes off the watch again. With a little over half a mile to go, I started to feel physically drained. At this point in a race, I would usually check my heart rate to make sure I wasn't maxing out too early. However, I had started to read a very interesting and fascinating book, Running on Empty by Marshall Ulrich, along with a great article on race psychology in this month's issue of the Running Journal and both had inspired and me to try something different. I started to tell myself to push just a little harder and to keep pushing. It wasn't much farther, I could tell I was in reach of a possible PR as long as I didn't falter now. 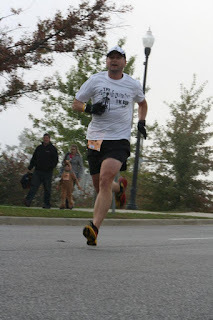 In previous 5K races, I had always slowed significantly at one stage during the race, either in the middle or in the during the last mile of the race. Not today, I wanted to slow down (as usual), but I kept pushing. There was one tiny little climb across a bridge left just before the finish so I dug a little deeper. Since this was a rather large race, I could hear the crowd cheering on trhe finishers. The picture below shows me just after the bridge and shortly before crossing the finish line. I finally looked up and noticed the race clock. It showed 19:20 and I didn't have very far to go. I couldn't believe it, not only was I going to PR, I was going to finally get that sub 20 minute 5K finish. When I crossed the line, my watch showed 19:43 as my finish time. I felt like I had just won the race. I didn't make the top 20 or even top 30, I didn't place top 3 in my age group (which I had done very regularly during road races over the last two years) but I didn't care at all. This felt so much better than any other short distance race or "podium finish" before. I had finally broken that 20 minute barrier, after trying for nearly two years. Raising my arms as I was crossing the finish line, I couldn't wait to share my joy. I grabbed a cup of Powerade and headed to my car. After putting on some dry, warm clothes, I grabbed my Blackberry and snapped a picture of my Garmin (see below). Next, I sent it to my running crew. After trying over and over and being asked every time if I had broken the 20 minute mark, I was finally able to respond "YES!". Hey, one thing's for sure, you can't call me a quitter. Of course Richard's response to my test was: "What's next? Sub 18?". Yeah, right. Right now, I'm quite content. However, the next goal has already been set, sub 19 minute 5K, here I come! This is the most important pic, sub 20 minute 5K PR two years in the making! The race conditions were perfect, cold temperatures, a fairly flat course, a great crowd. I hope I can continue to improve at all distances. I have certainly received validation for my new found interest in serious training and cross training and I will continue to do so. Please click here for official race results, once they are available.